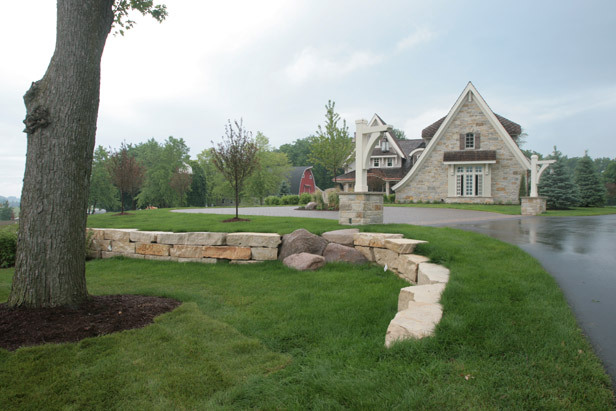 The landscape design for this home, located in Farmington, MN, was completed in June 2017. 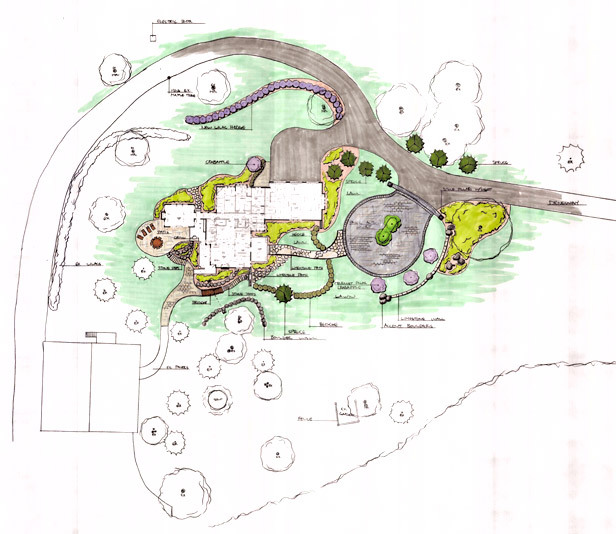 Below is an interview with David Kopfmann, founder of Yardscapes and the landscape designer for this project. Q: Describe the first meeting with the client. 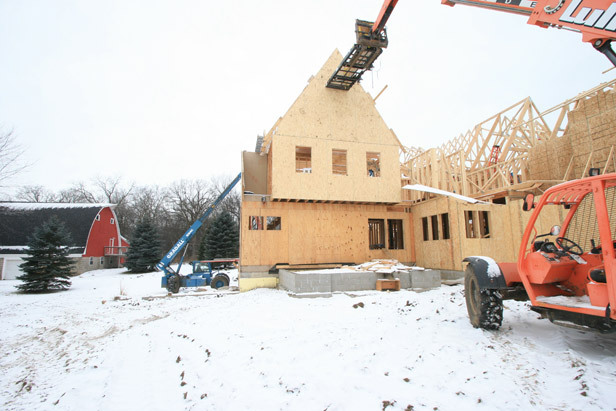 A: The first meeting with the homeowner was in December 2015. She was referred to us by the architect and past clients. 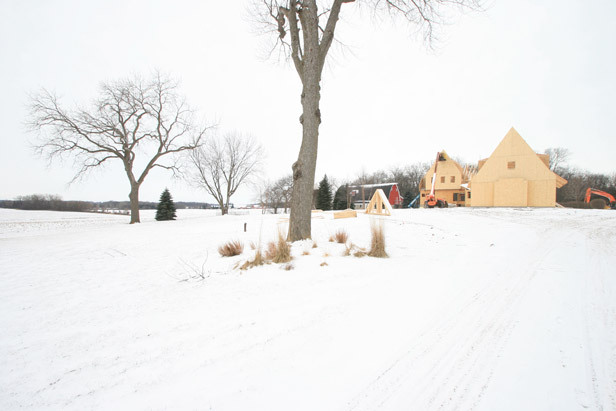 Her hopes for the landscape design was to make it feel like an old-world farmstead. 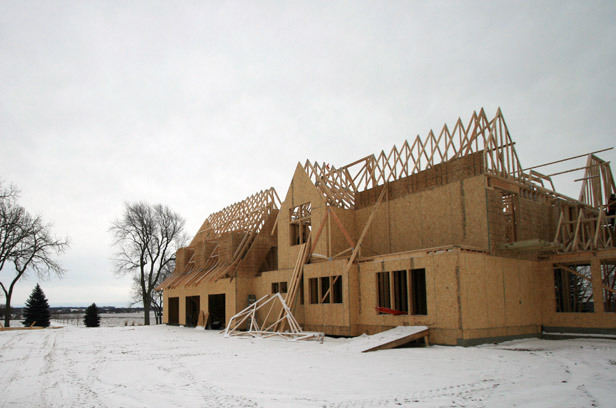 When I first visited the site the home construction had already began. I walked and reviewed the site with the homeowner to give her some ideas. 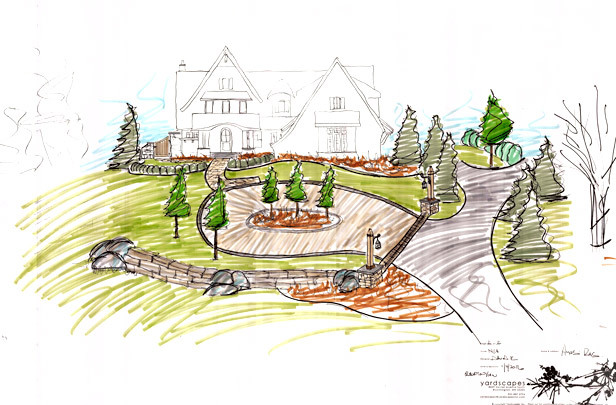 The grading and driveway were an important part of the design for the home and how she wanted it to look and feel (in terms of size). 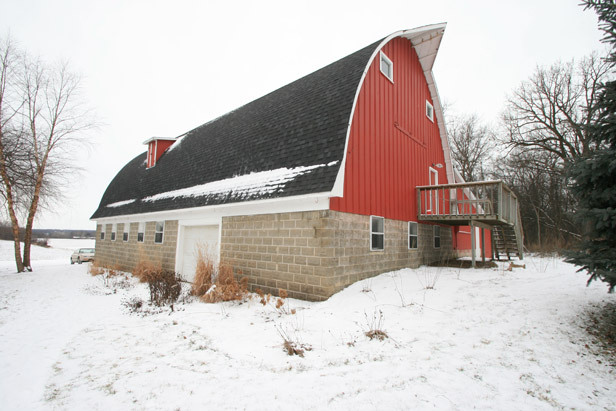 The homeowners had lived in the existing home on the property for many years and still wanted the home and landscaping to feel connected to the barn and silo. Q: What were some design challenges? 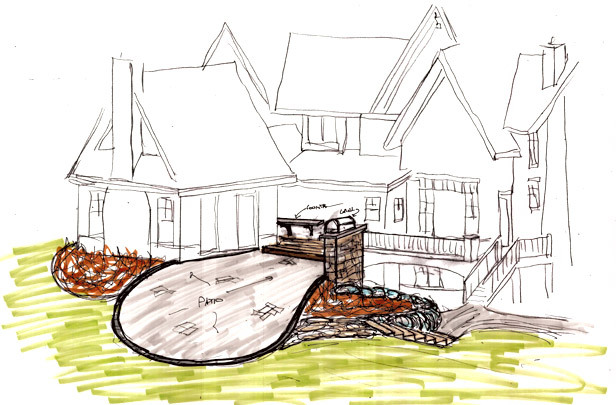 A: One of the main design challenges for this project was moving the water flow that collected under the back deck. To solve this, I created a walking path with a culvert under it to move the water away from the house. 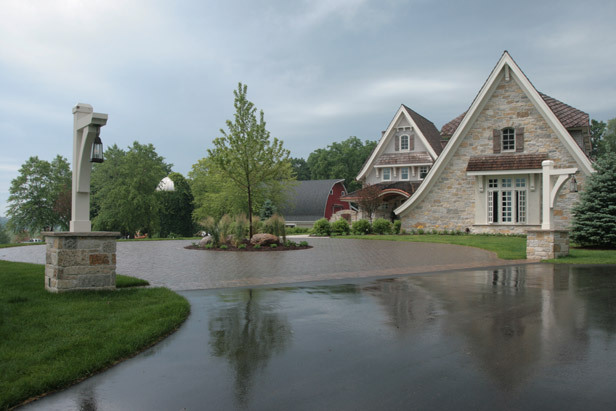 Another challenge was designing a driveway system to the barn, but separate from the circle. Q: What were some design inspirations for this project? 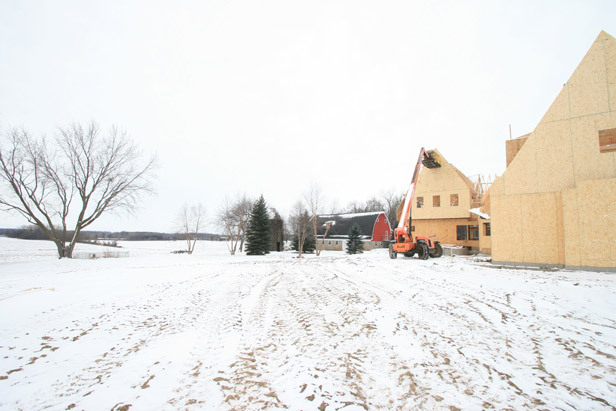 A: Most of the inspiration came from the architecture of the home, as well as the farm setting — the barns, silo, and fields have long views in all directions. I worked with the long, existing driveway as you approach the house to not to block the tresses (detail). I wanted the limestone slabs to be visible from the long driveway, but it is also there to support the circular portion of the driveway as well. 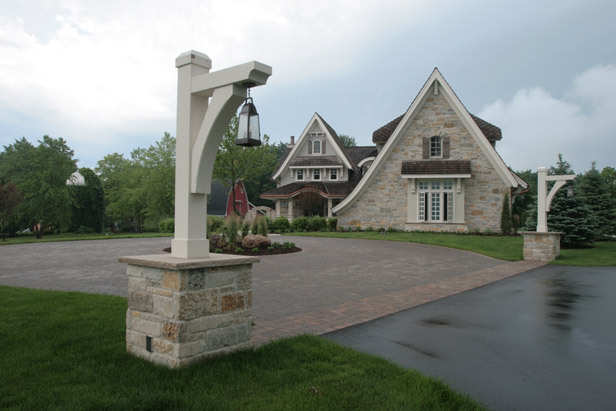 To creating an old world feel to the driveway we used tumbled pavers. We used just one size to give the illusion of old street pavers (cobblestone). 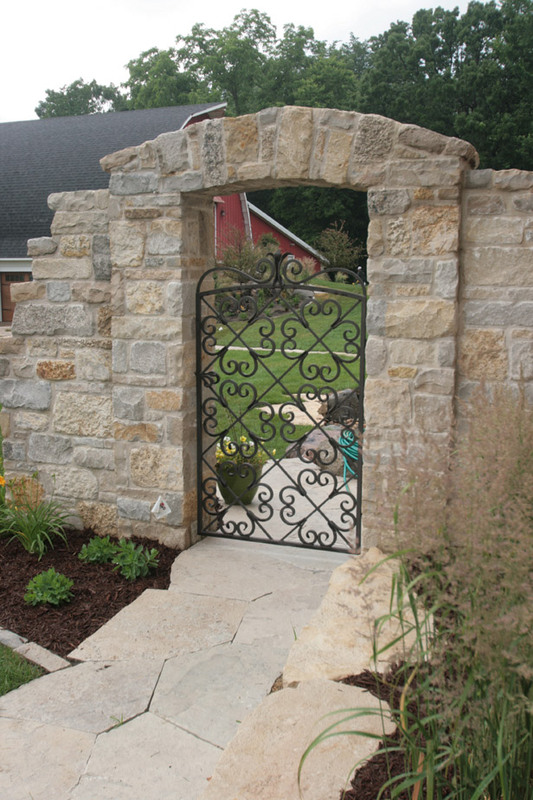 Limestone and boulder wall was built for aesthetics and function. It is what is supporting the circular driveway, but gives interest as you drive in to the home entrance. 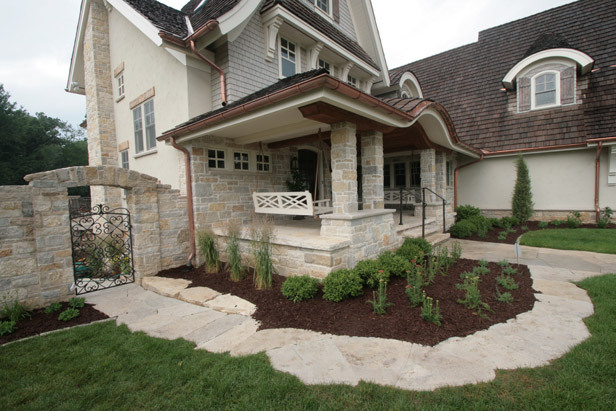 The front sidewalk is fond-du-lac limestone slabs. They are dry set over a clean rock base. 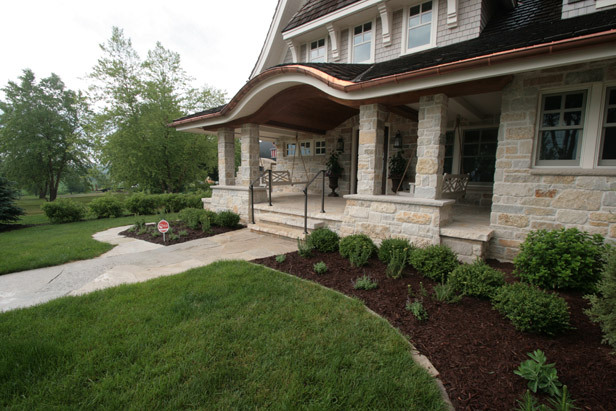 The front walkway bends and compliments the stone on the front terrace and home. I designed a slight curve to the walkway because of the length to move you through the courtyard hedges and plants that will create a natural fence for privacy, but not feel closed off, once they fill in. 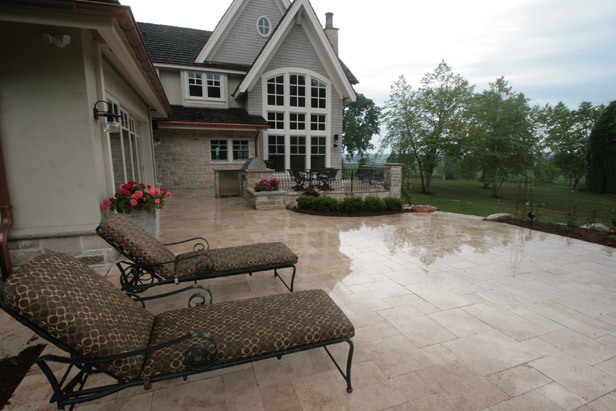 Travertine was used for the back patio/terrace to match the stone on the porch. Travertine is very smooth and light in color, so was a perfect choice on the south facing patio when the sun hits it will not get as hot as darker stone. 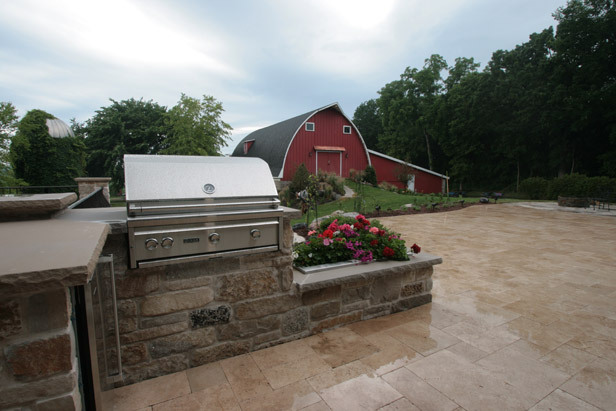 I designed the outdoor kitchen small, but functional, so that it would not block the views from the porch and terraces. 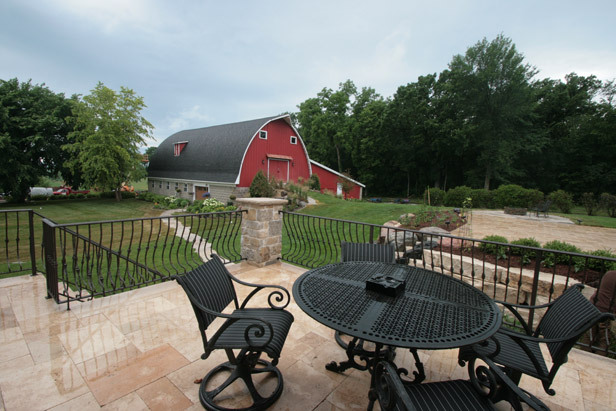 The landscaping added to the barn was planted with assorted perennials and ornamental trees similar to the planting around the home. 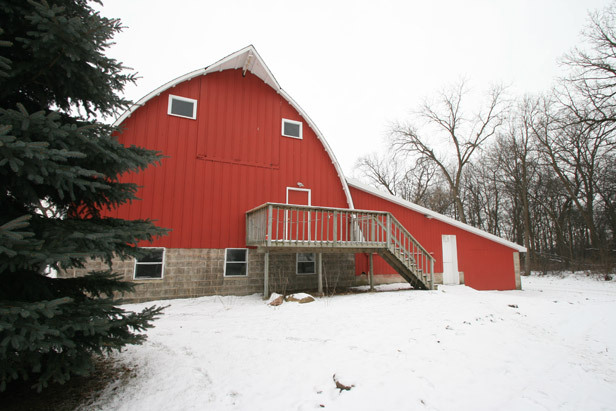 This makes the barn feel more connected to the home. We also chose specific plant material to attract and feed the birds. The side patio is located off of the master suite. I created a private outdoor sitting area, which is surrounded by small ornamental trees and a perennial garden. 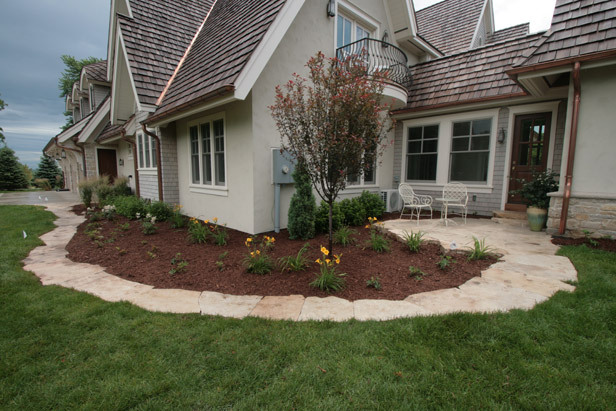 Landscape Designer: David Kopfmann, Yardscapes, Inc. 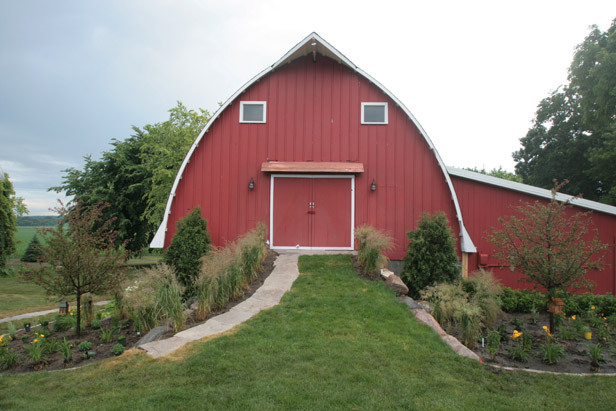 This entry was posted in Before and After, Finished Projects, Outdoor Kitchen and tagged Barn, Farmington, Farmstead, landscape, projects, Silo. Bookmark the permalink.